The program “Travel to the World of Science” is unique in its multidisciplinary and interdisciplinary approach to working with children from 4 to 12 years of age. The cycle of the program aims to introduce children with simple and easy experiments. Research program tasks are adapted to age and realistic children’s abilities, while program contents monitor the interests and abilities of each individual child and group as a whole. 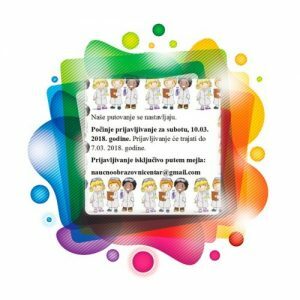 Work with children was also monitored by the psychological-pedagogical service that had previously adapted all experiments and approved the appropriate child’s age. The program includes educators, educational and scientific workers. Registration until March 7th at naucnoobrazovnicentar@gmail.com.